6 Tips to Shake Your Sugar Habit from JL Boston Member Joanne Draper - The Junior League of Boston, Inc.
Do you find yourself heading to the office vending machine or kitchen each afternoon, looking for a sweet pick me up? You aren’t the only one! But after that initial sugar high and boost of energy, you’re right back where you started: feeling tired and craving more sugar. In an effort to break the sugar cycle, JL Boston members gathered at HQ for an interactive discussion with fellow member Joanne Draper, where we learned just how much added sugar is in the foods we eat and how we can shake our sugar habits without having to go cold turkey. Crowd out sugar by adding in more nutrient-dense foods. 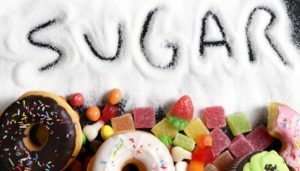 The reason many of us crave sugar is because we aren’t getting the nutrients we need to keep us full and keep our blood sugar at the right level. Before you try cutting sugar cold turkey, try and incorporate 1-2 more servings each day of nutrient heavy, high fiber foods like salmon, kale and potatoes (yes, there are actually a lot of nutrients in potatoes). These foods will keep you feeling full so that your body doesn’t crave the quick energy boost from sugar. Eat naturally sweet foods. When you’re craving sugar, instead of reaching for a cookie or piece of candy, enjoy a serving of naturally sweet fruits and veggies like corn, sweet potato, berries and pineapples. These options will help kill the sugar craving without causing your blood sugar to crash. Hydrate, hydrate, hydrate! Often times, when you start feeling hungry, you are actually just thirsty and need to hydrate. When the hunger pangs start, see if a glass of water makes a difference before you head to the kitchen for a sugary snack. To stay hydrated, start drinking water right when you wake up and keep a water bottle close by so that you are drinking continuously throughout the day. Baby step it. The biggest mistake you can make when cutting down on sugar is trying to go cold turkey. Within a few hours, sugar withdrawal sets in and you’ll feel miserable. To avoid jumping on and off the sugar wagon, start with the three tips above and go from there. Gradual change works. Decreasing your sugar intake is a long game, not a short one, and starting the process gradually makes things much less painful. Before you decide to cut out the sugar in your morning tea or coffee, try and decrease it a little bit each day so that your cutting down, but still enjoying your morning ritual. Instead of flavored yogurt (which is incredibly high in added sugar) try plain yogurt with a little honey and fresh fruit. Be good 90 percent of the time. What makes Joanne’s sugar philosophy so manageable is that she isn’t asking you to cut out all added sugar for the rest of your life (because who really wants to live that way?). She advises that you eat whole, nutrient-rich foods 90 percent of the time and eat what you want the other 10 percent of the time. This post was written by Communications Council QC Editor Liz DiVito.